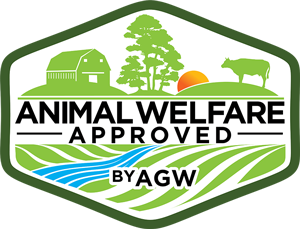 The Animal Welfare Approved program and food label promote the well-being of birds and the sustainability of humane family farms and meat plants. We unite conscientious consumers with farmers and meat producers who raise and harvest their birds with compassion. Our label adds value to meat products for those people who are raising, handling, and harvesting meat birds. The Guidelines for Poultry Slaughter Facilities should be followed by plants and on-farm facilities that slaughter poultry. Plants that slaughter cattle, hogs, sheep and goats should refer to the Guidelines for Red Meat Slaughter Facilities. 1.0.1 Whenever possible, poultry slaughterplants must record the number of birds that are dead on arrival and inform the farmer of this number. Note: If birds are slaughtered using CAS/CAK systems it may not be possible to identify and record all dead on arrival birds. 1.1 HANDLING OF BIRDS DELIVERED IN TRANSPORT CRATES AND OTHER CONTAINERS. 1.1.1 Any container in which poultry are transported must be handled with care and not thrown, dropped or knocked over. 1.1.2 Any container in which poultry are transported must be unloaded horizontally and kept in an upright position. 1.1.3 Any container with a perforated or flexible base must be unloaded with particular care in order to avoid injury to the birds inside. 1.1.4 All transport containers must be examined on arrival at the slaughterhouse to identify any birds suffering from injury, heat or cold stress. 1.1.5 Any bird identified as suffering from injury, heat or cold stress must be slaughtered promptly and humanely. 1.1.6 Live birds must be unloaded from transport crates individually. 1.1.7 Live birds must not be tipped out of drawers or other transport containers. 2.0.1 Transport containers must be unloaded from the transport vehicle as soon as possible after arrival at the slaughter facility. 2.0.2 Transport containers must not remain on transport vehicles longer than one hour after arriving at the slaughter facility. 2.0.3 If there is an unavoidable delay or breakdown that means transport containers must remain on the transport vehicle for longer than one hour, the plant must make sure that birds on the transport vehicle have shade, shelter, ventilation and water as appropriate. Note: The best air flow and comfort for the birds may be maintained by keeping the transport vehicle moving. 2.0.4 Once transport containers are unloaded, if birds are not immediately slaughtered the containers must be held in an area where birds are protected from extremes of temperature, direct sunlight and adverse weather. 2.0.5 Recommended The holding area should have reduced lighting. 2.0.6 Poultry must be monitored for heat and cold stress while being held in the holding area. 2.0.7 If monitoring shows evidence of heat or cold stress, or injury, immediate action must be taken. Note: Immediate action could include euthanization of an individual injured bird, use of fans to reduce heat stress and/or the immediate slaughter of an affected group or crate of birds. 3.0.1 Birds must be handled as little as possible up to the point of slaughter. 3.0.2 Birds must be slaughtered within two hours of arrival at the slaughterplant. 3.0.3 Recommended Birds should be slaughtered as soon as possible after arrival at the slaughter facility. 3.0.4 Birds must be unloaded from crates in a dimly lit room. 3.0.5 Birds must not be caught or carried by one leg. 3.0.6 Unloading of crates must take place as close as possible to the cones or shackle line to minimize carrying distance. 3.0.7 Inversion and suspension of birds must be minimized. 3.0.8 No bird can be inverted or suspended in such a manner as to cause it avoidable pain or suffering. 3.0.9 Birds must not be inverted and placed in cones or on shackles unless the personnel and means to slaughter them are immediately available and operational. 3.0.10 If birds are placed in cones these must be the correct size for the type of bird. 3.0.11 Chickens and ducks must not be inverted for more than 60 seconds before being stunned or killed. 3.0.12 Turkeys and geese must not be inverted for more than 120 seconds before being stunned or killed. 3.0.13.1 Cutting, bleeding or dressing any sensible bird. 3.0.13.2 Beating, striking or throwing any bird. 3.0.13.3 Any other action that causes intentional harm to a bird. 3.1.1 Recommended Live birds should not be shackled. Note: Shackles include static shackle hangers as well as automated lines. Once a facility within the maximum travel distance that does not use shackles is reviewed and recommended AWA will not permit the use of a facility where birds are shackled. 3.1.2 If shackles are used they must be the correct size and width for the birds. 3.1.3 If shackles are used birds must be hung by both legs. 3.1.4 The shackle line must be designed and positioned in such a way that the bird suspended on it is clear of any obstruction – including when its wings are outstretched. 3.1.5 There must be no unevenness in the shackle line that causes the shackles to jolt. 3.1.6 The whole length of the shackle line must be immediately and easily accessible by any person so that a bird can receive individual attention as required. 3.1.7 From the point of shackling to the point of stunning there must be no noises that cause unnecessary disturbance to the bird. 3.1.8 The speed at which the shackle line is operated must be such that any act or operation carried out on any bird suspended from it can be performed without undue haste and with proper regard for the welfare of the bird. 3.1.10 Shackles must be cleaned and maintained according to manufacturers’ specification. Note: Rust on shackles may prevent effective electric stunning. 3.1.11 Recommended The shackle line should follow as straight a line as possible. 3.1.12 Recommended Breast comforters should be used when birds are shackled. 4.0.1 Stunning must render birds immediately insensible to pain on the first attempt. 4.0.2 Stunning must ensure birds remain insensible to pain until the bird dies due to slaughter or blood loss. 4.0.3 All birds must be rendered insensible to pain prior to being cut. 4.0.4 If any sign of sensibility is observed at any time after stunning, the bird must be re-stunned immediately. 4.0.5 Equipment used to shackle, stun, bleed and kill a bird must be kept and maintained in line with the manufacturer’s instructions. 4.0.6 Equipment used to shackle, stun, bleed and kill a bird must only be used within the design parameters described by the manufacturer. 4.0.7 For all stunning equipment there must either be a manual back-up or reserve equipment for use in case of emergency or breakdown; or there must be a protocol to shut down the line/stop slaughtering and remove any live birds from shackles or cones. 4.0.8 Staff that carry out stunning and bleeding must have been trained and be competent to use the available equipment. 4.1.1.1 Penetrating captive bolt and non-penetrating captive bolt. 4.1.1.2 Electric stunning via hand held devices. 4.1.1.3 Electric stunning via water bath. 4.2.1 When using a captive bolt gun a type of sufficient power with the right cartridge or propellant according to the manufacturer’s specifications must be used. 4.2.2 Captive bolt stunners must be cleaned and maintained according to manufacturers specification. 4.2.3 Persons using captive bolt guns must be trained in safe handling and proper stunning placement. 4.2.4 A penetrative captive bolt must enter the brain to provide an effective stun. 4.2.5 If birds show signs of recovery after this type of stunning action must be taken to assess and resolve the reason. 4.3.1 Handheld electrical stunning devices and electric plate stunners must provide a strong enough current and be in contact with the bird for long enough so that it is immediately unconscious. Note: guidance on appropriate current levels for different types of poultry can be found in Annex 1. 4.3.2 Persons using hand held and plate electric stunners must be trained in safe handling and proper stunning placement based on the species being stunned. 4.3.3 Hand held and plate electric stunning equipment must only be used on the species that the manufacturer recommends and which it is designed for. 4.3.5 Recommended Electrodes should be placed to span the brain of the bird. 4.3.6 Recommended Stun settings and voltages should be recorded when hand held electric stunning or electric plate stunning is in use. 4.4.1 The strength and duration of the current used in electrical water baths must be such that the bird is immediately rendered unconscious and remains so until it is dead. 4.4.2 When an electrical water stunning bath is used the stunning bath must be set at a height appropriate for the size and number of birds. 4.4.3 When an electrical water stunning bath is used the bath must be set such that the heads of all birds make effective contact with the water bath. 4.4.4 The water bath must be of sufficient size and depth and the water must not overflow at the entrance. 4.4.5 The electrode immersed in the water must extend the length of the water bath. 4.4.6 The water bath stunner must be designed and set up to prevent birds receiving pre-stun shocks. 4.4.7 Where poultry in a continuous flow in a shackle system are stunned in a water bath, the voltage and current used must be sufficient to produce a current strong enough to ensure that every bird is stunned. 4.4.8 The current must pass efficiently through the bird. In particular there must be good electrical contacts and the shackle-to-leg contact is kept wet. 4.4.9 There must be someone monitoring birds exiting the water bath stunner to check whether it has been effective in stunning the birds and who, where it has not been effective, will either stun and slaughter or kill any bird without delay. 4.4.10 Recommended Water baths should be fitted with an ammeter to accurately monitor current flow through the bath when loaded with birds. 4.5.1 Recommended Controlled Atmosphere Stunning (CAS) and Controlled Atmosphere Killing (CAK) systems should be used to render poultry insensible. 4.5.2 Recommended The use of anoxic gases rather than CO2 is recommended for both CAS and CAK. 4.5.3 The controlled atmosphere system must rapidly cause insensibility. 4.5.4 Persons using the gas stunner must be trained in proper use of the stunning system. 4.5.5 Birds must be exposed to a carbon dioxide, nitrogen and/or argon gas mix at a concentration sufficient to cause unconsciousness and/or death quickly and calmly with the minimum of discomfort. 4.5.6 CAS/CAK using carbon dioxide must only be used in multi-phase processes (at least two phases) where birds are initially stunned by remaining in a mix of not more than 30% CO2 for at least a minute before moving into higher concentrations of this gas. 4.5.7 The gas system must be used according to manufacturer’s instructions. 4.5.8 In CAK systems birds must not be found to recover consciousness after exposure to the gas mixture. 4.5.9 Gas concentration in the chamber must be monitored. 4.5.10 Recommended Visible and audible warning signals should be displayed if gas concentrations fall below levels capable of producing an effective stun and/or kill. 4.5.11 Birds must not enter the system if gas levels are known to be too low to produce an effective stun. 4.5.14 There must be a means of flushing the chamber with atmospheric air with the minimum delay. 4.5.15 There must be means of access to any bird in any part of the chamber with the minimum of delay. 4.5.16 Recommended Plants should record and investigate signs of damage or injury to the birds which has occurred while they are in the chamber. 4.6.1 Birds must be bled within 10 seconds of stun. Note: This standard does not apply to birds from CAK systems. 4.6.2 When one person is responsible for both stunning and bleeding these operations must be carried out consecutively on each individual bird before moving on to the next. 4.6.3 The bleed wound must be large and allow rapid bleeding. Note: The carotids or arteries from which they originate from must be severed, depending upon the species. The objective is to stop supply of oxygenated blood to the brain. 4.6.4 The bird must be observed during bleeding for signs of sensibility and if any are seen it must be re-stunned immediately. 4.6.5 Where automatic neck cutters are operated there must always be someone present to check whether or not the neck cutters have effectively severed at least one of the carotid arteries or the vessels from which they arise and to take action if they have not. 4.6.6 Birds must be checked to ensure they have been effectively slaughtered before entering a scald tank or plucking machine. 4.6.7 Birds must not be placed into a scald tank or plucked until at least 90 seconds (for chickens) or 120 seconds (for turkeys, geese and ducks) have elapsed from the time of bleed. 5.0.1 There must be a named individual responsible for bird welfare within the facility that has the authority to take action should any welfare issues arise. 5.0.2 Training in humane methods of poultry handling must be made available to all staff working with live birds. 5.0.3 Staff must be trained to recognize signs of effective and ineffective stunning and signs of recovery of consciousness. 5.0.4 There must be clearly written standard operating procedures for every step of the operation and staff responsible for animal handling, stunning and slaughter must be familiar with these procedures.